↑ Seelye, Katharine Q. (July 6, 2009). "Bush Celebrates Easter at an Outdoor Service". New York Times. 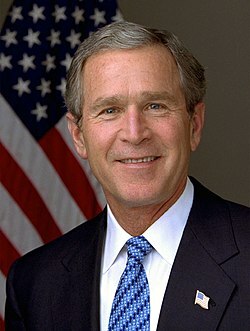 http://www.nytimes.com/2001/04/16/us/bush-celebrates-easter-at-an-outdoor-service.html. Retrieved April 16, 2001. ↑ Cooperman, Alan (September 15, 2004). "Openly Religious, to a Point". The Washington Post. Archived from the original on May 24, 2012. https://archive.is/FSmz. Retrieved September 1, 2008. ↑ Kakutani, Michiko (September 5, 2007). "Bush Profiled: Big Ideas, Tiny Details". The New York Times. http://www.nytimes.com/2007/09/05/books/05kaku.html. Retrieved September 1, 2008.